I’ve spent my life using my hands to do all the things I enjoy: writing, drawing, painting, typing, working on the computer, doing crafts, etc. Now I’m paying for it. I’ve actually overused my hands to the point of inflammation and pain. I guess I shouldn’t be surprised; I work seven days a week most of the time, and even when I’m not working, I’m usually doing something with my hands. About the only breaks my poor hands get are when I watch DVDs (except those times when I’m watching DVDs and doing something else) and when I sleep. The doctor says it’s time to stop. I’ve had to cancel all of the remaining 2010 Carpe Canem benefit auctions and tell all of my work clients that I can’t work for an indeterminate amount of time. The good news is that there’s no permanent damage to the nerves and muscles; the bad news is that doing nothing is boring. However, my hands are slowly getting better. So…hurray. One advantage to not being allowed to do most of the things I’m used to doing is that I have free time to do a few things I don’t normally get to do, one of which is decorate for Halloween, something I haven’t done for several years, even though Halloween is my favorite holiday. You see, Halloween is such a favorite holiday that I used to host a pretty significant home haunt, Greyhaunt Manor. Unfortunately, while we were doing the haunt, Greyhounds of Fairhaven got invited to participate in the Doña Ana Arts Council Renaissance ArtsFaire in Las Cruces, New Mexico – and they pay us to be there. The ArtsFaire is always held the first full weekend of November, putting it in conflict with Halloween most years. So we had to decide whether to stay home and spend lots of money and time having fun with the haunt, or get paid to go to New Mexico and have fun there. Since the money goes to the hounds, the decision was obvious – we had to choose the ArtsFaire over the haunt. Once we made the decision to cancel the haunt, we sold nearly all of our props and equipment, and I spent the next several Halloweens (the ones when we weren’t on the road to New Mexico) either at a friend’s house or hiding in my own darkened house. 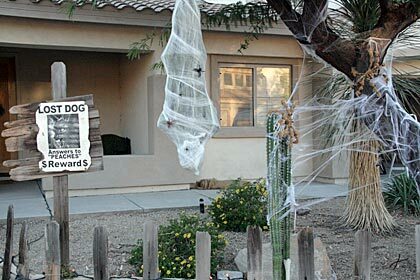 It’s not that I didn’t want to do something for Halloween; it’s that the neighbors for miles in every direction loved the haunt so much that I figured doing anything less would be a terrible disappointment to them, and I didn’t want them to get their hopes up by seeing me decorating for Halloween. Last weekend, I started to get the Halloween bug again and decided I had to do something this year, even if it was just put on a costume and hand out candy. Since I can’t work, I spent Monday shopping for Halloween goodies. I wasn’t sure what or how much I wanted to do, but I knew I’d figure something out based on what I was able to buy. The shopping went well, and Tuesday at noon I started to decorate the yard. I had hoped the neighbors would have forgotten about the haunt so seeing me decorating the yard wouldn’t mean anything to them. No such luck. Everybody who passed by on foot or in a car stopped to ask me if we were going to “do the haunted house” this year. Even people who weren’t living in the area when the haunt was active stopped to ask about it, because they’d heard about it from their neighbors. 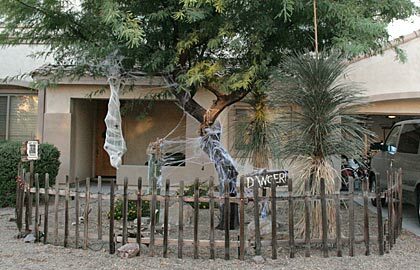 Sadly, I had to tell everyone there wasn’t going to be a haunt, just some decorations, but we’d still try to make it scary with what we had. To my pleasant surprise, everybody was very understanding and happy that we were doing something. I worked from noon until about 6:00 pm, and I managed to get a nice little “spider garden” scene set up in the front yard, including some eerie lighting. The spider garden, complete with encased victim - probably one of the visitors from a past year. DANGER! While I was setting up the fence, I stumbled upon the remains of a dead bird in the yard. 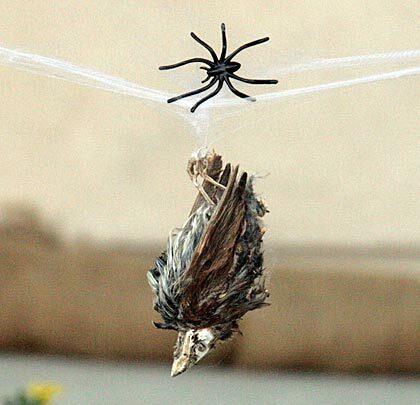 It was thoroughly desiccated – really nothing more than bones and feathers – so I hung it from the webbing and added a plastic spider. I think it adds a nice gruesome touch. A touch of realism - Mother Nature's contribution to the decorations. 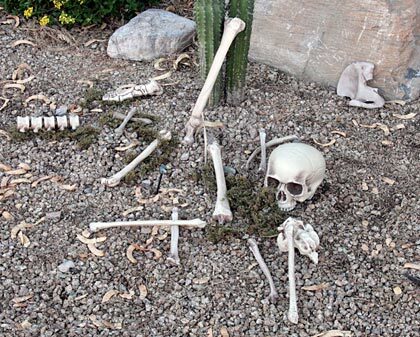 The bones of a previous spider victim scattered in the yard. I took the hand bones of the previous spider victim and gave them to one of the spiders to hold. It’s hard to tell because of the angle of the photo below, but the spider is holding the hand bones out, perhaps offering them to an onlooker. 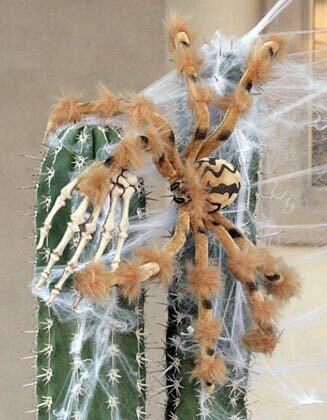 This spider would like to give you a hand. By the time I put the final touches on the yard decorations, it was getting dark, so I only got a few things done on the porch; I’ll finish it tomorrow and try to get some more pictures, including pictures of the spider garden at night. This entry was posted on 26 October 2010 at 10:25 pm and is filed under Halloween, Haunts. You can follow any responses to this entry through the RSS 2.0 feed. You can leave a response, or trackback from your own site.